When you are growing plants indoors, you will need a good grow light that can give them as much light as possible, or one that is as close to the natural light from the sun as possible. If you are growing your plants in a real dark place like the basement, then you need a good grow light that can provide lighting for the plants from germination to fruiting. That is why I decided to look over several products in the market that can help you in that regard and one of them is the Galaxyhydro 300W LED Full Spectrum Grow Light. Why is it good for growers? Here is what I found out…. I have used a few grow lights myself but I must say that the features that the Galaxyhydro 300w packs are pretty awesome. This grow light has the red and blue spectra of course, not forgetting that it also has IR, UV and white light. The light spectra start at 430nm to 730nm – IR and then there is the UV 380 – 400nm as mentioned earlier. There are many grow lights in the market, but this one stands apart from all the others because of the control that it gives you as the grower. If you are growing marijuana indoors and it gets to a point where you feel that it needs more light, you can just increase the amount of light that this grow light will dispense. Does this mean more energy expenditure? The difference is negligible really. Remember, this is LED light. Think some more about this feature… you will love it. Instead of struggling to raise or lower the height of the light to control the intensity, just turn the dial located at the back. As I buy most of my stuff online, one thing that I have come to respect so much over time is a manufacturer who is ready to stand by his product. This is best demonstrated by warranties and guarantees. When you buy the Galaxyhydro 300W LED grow light, it comes with a money back guarantee of 30 days and a warranty of 2 years. In addition, should you have any trouble with the light, you can contact customer care. I sent them an email to see how fast they respond and they responded in less than 8 hours. Not as fast as I would like but then it is better than no response at all. 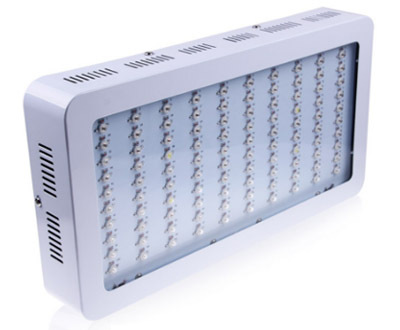 Although it is written as rated at 300 watts, it is not the real power consumption because this grow light actually consumes 170 watts. However, its light output is not affected. It remains intense and therefore there will be no loss for the plants at all. Most of the grow lights usually consume lower energy than is usually indicated. There are two inbuilt cooling fans in the Galaxyhydro 300w LED grow light that help in dissipating heat generated by the grow light. This keeps it cooler to the touch of the hand even if it has been working for more than 18 hours. There are all of 100 LEDs which make the grow light brighter than most others. This means that even at the stages where your cannabis plants requires more intense light to produce more robust leaves, this lamp will serve the purpose very well. Other grow lights have 12 LEDs, but this one has 100 pieces. It is well known that the more the light, the earlier the plants will bloom and fruit, meaning you are going to have an early harvest. For once in my online forays, I can say I have found a product that has no cons at all. The Galaxyhydro 300w LED full spectrum grow light is every grower’s dream. The long warranty and the money back guarantee are enough to show you the confidence that the manufacturer has in his product.